The current overall global art market also finds that contemporary art has, for the first time, “truly begun to rival the historically dominant Impressionism and Modern categories” at auction. (5) Evidence to the overall market’s growth, The Financial Times has recently been publishing how-to articles about art collecting in general and at least one art hedge fund has been established. Situated within this historic global market growth, expansion into China and other regions is seen as having contributed significantly overall. In addition to the work having dramatically appreciated, China has a new class of art collectors, with new levels of wealth among them. In fact, expansion into China and other “new” regions is often used in the case against the market’s potential crash. Chris and Eloisa Haudenschild’s level of commitment and knowledge is evidenced by the way they support contemporary art beyond collecting. The Haudenschild Foundation supports exhibitions and sponsors artists’ and scholars’ projects and programs such as symposia and residencies at the haudenschildGarage. Perhaps their most ambitious project yet was an exhibition entitled Zooming into Focus: Contemporary Chinese Photography and Video from the Haudenschild Collection, which took place from 2003 to 2005 and traveled to venues in San Diego, Shanghai, Tijuana, Singapore, and Beijing. Of these seventy individual works produced by twenty-eight artists, two of the works were produced by women artists: Cao Fei and Kan Xuan. Three of the artists are thirty years old or younger, while ten are between thirty-one and forty, fourteen are between forty-one and fifty, and one artist is over sixty. Most of them are based in Shanghai, with a few based in Beijing, Hangzhou, Shenzhen, Yangjiang, Guangzhou, and Haikou, Hainan. Only Kan Xuan maintains a residence both in Beijing and abroad, in Amsterdam. Eloisa Haudenschild, née Rodriguez-Carbonell was born into an affluent family in Buenos Aires, Argentina, who were involved in real estate and politics. When asked, she said she probably could be considered a third- or fourth-generation collector, and keeps some of her family’s paintings and antiques in the La Jolla estate. She met Chris Haudenschild, an astrophysicist-entrepreneur and native of Los Angeles, skiing in Portillo in 1973. Chris Haudenschild, who has roots in Iowa and Indiana, is a first generation collector. Together they have two daughters, Rita and Anna, whose artwork is also listed in the collection’s catalogue. Eloisa Haudenschild’s educational background is in psychology. She was involved in dance and choreography before pursuing her interest in contemporary art. She cut her art-collecting teeth in the early 1990s with contemporary work from Latin America. At that time, she was president of the bi-national board of inSite, a network of contemporary art programs and commissioned projects that map the liminal border area of San Diego and Tijuana. When Chris Haudenschild, founder and president of CliniComp, a healthcare information management system, began expanding his business into China, the couple began making regular trips to Shanghai. As she had done in Latin America, Eloisa Haudenschild sought to investigate the local art scene in Shanghai. Dadou, or Davide Quadrio, founded BizArt, a self-supported non-profit gallery, in Shanghai in 1998. Along with ShanghART, it shares billing as one of the oldest contemporary art institutions in the city. Previously, Mr. Helbling had been showing work at the Portman Ritz-Carlton Hotel, a massive hotel, convention centre and residence in Shanghai. “He used to carry paintings around on the back of his motorcycle trying to sell them, because at that time he didn’t have a space,” recounts Haudenschild. Since then, ShanghART has moved from its Fuxing Park location and expanded into three different spaces within Shanghai. A fourth space opened this year in Beijing. She said he has never given her explicit advice, saying, “You know how it is with Lorenz, you never know [what he’s really thinking]. He’ll listen, smoking, with his coffee. And then he’ll say, ‘Eloisa, I think it’s time to think.’” Helbling and Zhou did, however, encourage her to look at certain artists. After that initial trip, Haudenschild says she did a fair amount of research, contacting and meeting with scholars and curators in the field. She went to Paris and met with Hou Hanru, and exchanged emails with Britta Erickson. Perhaps in testament to the perceived need for a studied, serious, aesthetics-based treatment of contemporary Chinese art, Haudenschild said her queries to these noted curators and scholars—“from me, this little collector”—were enthusiastically received. Meantime, she continued collecting on her regular trips to China. In general, photography and video, like other edition-based media, have traditionally sold for less than paintings. Despite their lower value within the market, however, these media, as previously mentioned, are important to contemporary Chinese art and often become vehicles for highly conceptual projects. Critic and scholar Lu Leiping describes photography and video as the “most experimental and pioneering media today,” and “the media that more strongly maintain the Chinese characteristics.” (15) Indeed, many artists represented in the Haudenschild collection work solely in photography and video, and several are now highly sought after in large international exhibitions and biennials. ART: THE "ALTERNATIVE ASSET CLASS"
Indeed, much of the current dialogue surrounding contemporary Chinese art, and contemporary art as a whole, is in the language of finance. Mrs. Haudenschild stands apart from the object-focused connoisseur as well, giving importance instead to her relationships with artists and members of the community. “For me, the collecting is just a token, a way to support these young guys . . . . The reward is that I have the opportunity to be part of their path.” She affectionately describes the relationships among the artists represented in her collection, noting that they have maintained their integrity and loyalty to one another as friends in spite of experiencing unequal degrees of recognition. “You know, there are many collectors who are buying pieces and then putting them away until they become valuable—they don’t even show the work. And that is such a waste—these people need exposure,” she said. Art collected by individuals from a different country than the origin of the artist is now a common practice. Today, there are numerous galleries dealing exclusively in contemporary Chinese art in cities around the Western hemisphere. The question of what influence the foreign collector of contemporary Chinese art has on the globalized art world is a complex one. “Foreign collectors held out [the] olive branch,” according to critic Lu Leiping, in influencing the establishment of serious interest in contemporary Chinese new media art such as that in the Haudenschild Collection. (25) Jonathan Napack wrote: “That is not to say that there is no real basis for the current foreign interest in Chinese art. This huge country, for so long off the map, is producing artists who can draw on a wellspring of images, concepts, and issues that are totally unique to China and produce works that have that elusive ‘local flavour’ increasingly rare in a globalized world.” (26) However, an often-discussed problem is that the possibility for this “local flavour” is diminished once the artwork is brought to market. A less-discussed question, whose answer remains to be seen, is, as they become part of the global art market, how are China and other “new markets” for contemporary art changing it? Will contemporary Chinese art be subsumed by the same practice seen in the Euro-American art market of limitation and marginalization of different groups, such as women and minority artists? Consistent with Western art, works by male Chinese artists generally sell for more at auction than those of women. Living Han male artists have appeared much more prominently in the exhibitions of important collections. This also fits with the Western art historical tradition of marginalizing, ignoring, and dismissing women artists within Chinese art history. (27) Just as Chinese art, which has not reached the heights that Euro-American art does at auction, is marginalized by art world regionalism, female Chinese artists may be marginalized even more. Here again, private collections occupy a unique space. Private collections, “driven as they are by passion, unencumbered by institutional impedimenta” (as Erickson was quoted as saying in the introduction to this essay), are truly private in nature, and do not fall under the type of public scrutiny that attempts to address and confront the gender- and ethnicity-based biases about an artwork’s value that is at work in public collections. In addition, through the funding of exhibitions, the establishment of art centers, and the lending of artworks, private collections may indirectly promote the marginalizing practices of the institutional and historical art worlds. On the other hand, private collections also present the possibility of freely challenging and questioning such biases, which, as attested to by Lorenz Helbling, is perhaps what Eloisa Haudenschild has attempted to do. She said, “You know, Chinese art has become this kind of cliché.” Gesturing around the garage that houses many of the collection’s significant photographs, including Yang Fudong’s The First Intellectual series of photos (2000), Song Tao’s In Loud Crowds I Dream of Hanging Myself (2002), and Lu Chunsheng’s Water photos (2002), she said, “I’m thankful I was able to get these pieces, but I know it’s become a little bit like a fashion show.” Expressing an increased interest in funding projects, she said, "I’m not even sure I want to be a collector anymore. But I have to make a choice that I can live with." 1 Plates of much of the Chinese collection can be found in the exhibition catalogue, Zooming Into Focus: Contemporary Photography and Video Art from the Haudenschild Collection, Shi Yong and Laura Zhou, eds. (Shanghai: ShanghART, 2005). Images of the Haudenschild’s other holdings may be found at www.haudenschildgarage.com. 3 “Chinese art is now beginning to be aggressively collected by the Chinese themselves,” said Boriana Song, manager of the Chinese-owned Beijing Art Now Gallery. ”But now Chinese buyers are hungry for culture, and they see contemporary art as fashionable. The market is maturing, tastes are changing, and more than 60% of our clients are local Chinese.” Pallavi Aiyar, “Modern art scene grabbing investors,” Asia Times Online, April 11, 2006, http://www.atimes.com/atimes/China_Business/HD11Cb05.html . 6 Britta Erickson, “Zooming Into Focus, Sliding Into History,” in Zooming Into Focus, 14–15. 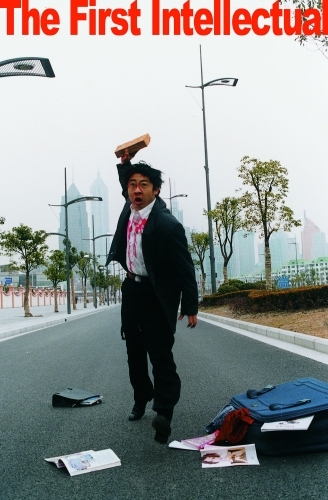 7 Lu Jie, “Contemporary Art in Greater China: Under Pressure, A Discussion at the 52nd Venice Biennale,” Yishu Journal of Contemporary Chinese Art (September 2007), 8–24. 8 Jonathan Napack, “An Art Market With Chinese Characteristics,” Yishu: Journal of Contemporary Chinese Art (March 2006), 16–17. 9 Erickson, “Zooming Into Focus, Sliding Into History,” in Zooming Into Focus, 14–15. 10 Martina Koppel-Yang, “Compelling Images of a Distant Life, Video as Expansion of Reality,” in Zooming Into Focus, 71–72. 11 Erickson, “Zooming Into Focus, Sliding Into History,” in Zooming Into Focus, 14–15. 13 Information about the collection provided by the haudenschildGarage. 14 Statements by and biographical information about Mrs. Haudenschild based on a conversation at the haudenschildGarage on September 5, 2007, a telephone conversation on September 12, 2007, and e-mail exchange. 15 Lu Leiping, “When Experiment Encounters Classics,” in Zooming Into Focus, 19–21. 16 Deborh Brewster, “Investing in the art market,” Financial Times, July 13, 2007, http://www.ft.com/cms/s/2/a531d0d2-3153-11dc-891f-0000779fd2ac.html . 18 Kelly Klaasmeyer, “RED HOT: Asian Art From the Chaney Family Collection,” Houston Press, September 13, 2007, http://www.houstonpress.com/2007-09-13/culture/red-hot-business/ . 19 Robin Pogrebin, “Volatile Markets? Art World Takes Stock,” New York Times, August 29, 2007, http://www.nytimes.com/2007/08/29/arts/design/29mark.html, accessed 08/24/07 . 22 Sharon Reier, “Contemporary Art: Follow the Money—The Latest Status Investment is Showing Signs of a Bubble,” International Herald Tribune, January 27, 2007, http://w4.stern.nyu.edu/news/news.cfm?doc_id=6894 . 23 Napack, “An Art Market With Chinese Characteristics,” Yishu: Journal of Contemporary Chinese Art (March 2006), 16–17. 24 Lu Jie, “Contemporary Art in Greater China: Under Pressure, A Discussion at the 52nd Venice Biennale,” Yishu Journal of Contemporary Chinese Art, September/Fall 2007, 8–24. 25 Lu Leiping, “When Experiment Encounters Classics,” in Zooming Into Focus, 19–21. 26 Napack, “An Art Market With Chinese Characteristics,” Yishu: Journal of Contemporary Chinese Art (March 2006), 16–17. 27 Marsha Weidner, preface to Flowering in the Shadows, Women in the History of Chinese and Japanese Painting, ed. Marsha Weidner (Honolulu: University of Hawaii Press, 1990), xi–xiv. 28 Napack, “An Art Market With Chinese Characteristics,” Yishu: Journal of Contemporary Chinese Art (March 2006), 16–17.